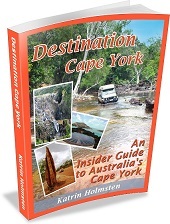 On this page is some practical Cape York info for your trip. Are there EFPTOS facilities or do I need to bring cash? Are there enough fuel stations or do I have to carry jerry cans? Is there anywhere to buy food or should I stock everything up? And what about the bottle shops? There are enough fuel stations that on most roads you should not have to carry jerry cans with a proper 4WD vehicle's fuel tank(s). There is a map of fuel stations and the distances between them all in the Destination Guide. It is always smart to carry a bit of cash on a Cape York trip, since all the places don't necessarily have EFPTOS facilities. There is a map of all the places with EFPTOS facilities in the Destination Guide, along with explanations in which ones, and how, you get the cash out. All the shops, grocery shops and bottle shops with opening hours and contact details are listed in the Destination Guide. They are not everywhere, but you will always know your closest one and when they are open. It's worth stocking up some, but consider the alcohol restrictions. Alcohol restrictions are in place in indigenous communities. All the bans and restrictions, and where do they actually apply, are outlined in the Destination Guide. Penalties are very heavy - up to 18 months in jail, $75,000 fine, and instant vehicle confiscation. 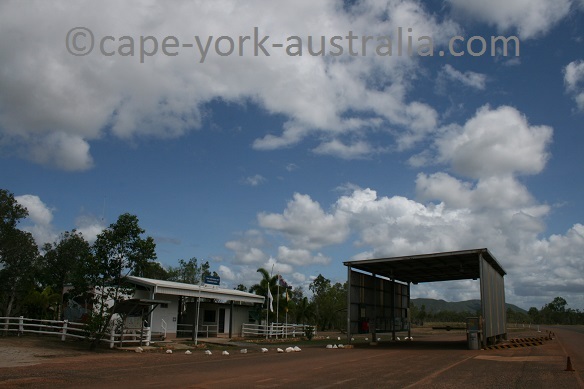 Cape York is a quarantine area, to protect the rest of Australia from any animal diseases or plant parasites to come in here from Torres Strait and the areas north of it. They need to stay here or they can spread to the rest of the country. Read about what that means to you on your trip. 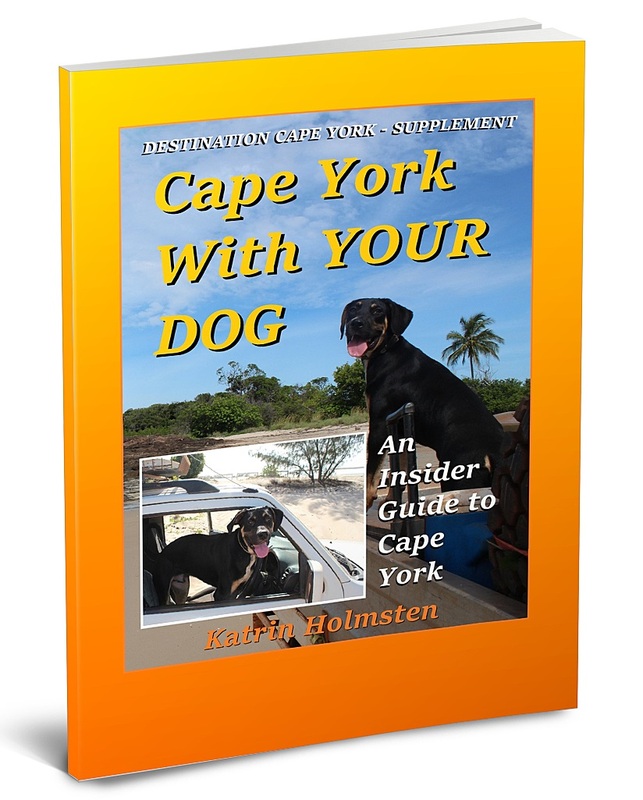 Many people ask about info to bing your pets to your trip to Cape York, and wonder what are the disadvantages and restrictions. If you are a dog owner - details about where are dogs allowed, are now in the Destination Guide, along with camp grounds that allow them. NEW - March 2017 - there is now a 33 page Dog Booklet! 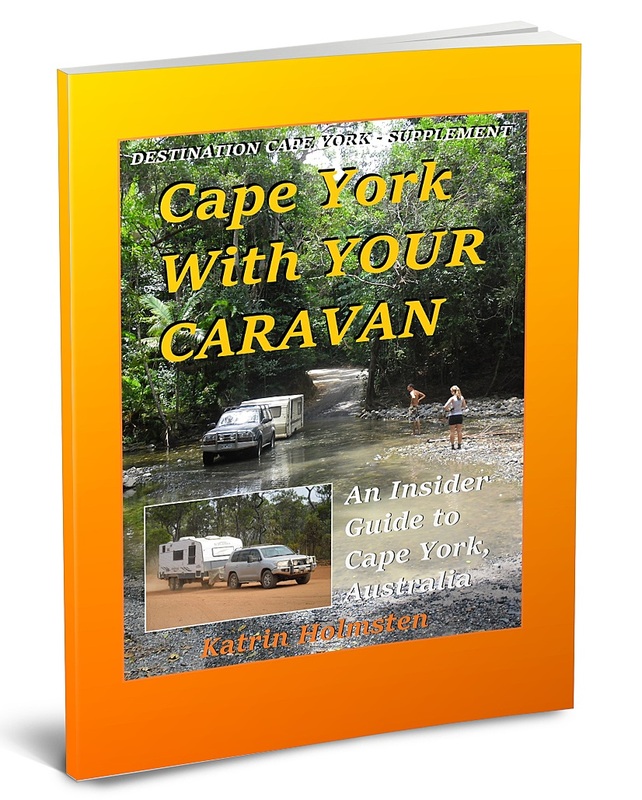 Also caravan owners ask about bringing their vans, and while Cape York definitely did not use to be a caravan destination, more and more people now bring theirs. You have to bear in mind the main road north is not sealed - your van will get shaken, and it will take some damage. NEW - March 2018 - there is now a 42 page Caravan Booklet! And finally, if you are from overseas you might wonder about the local time. 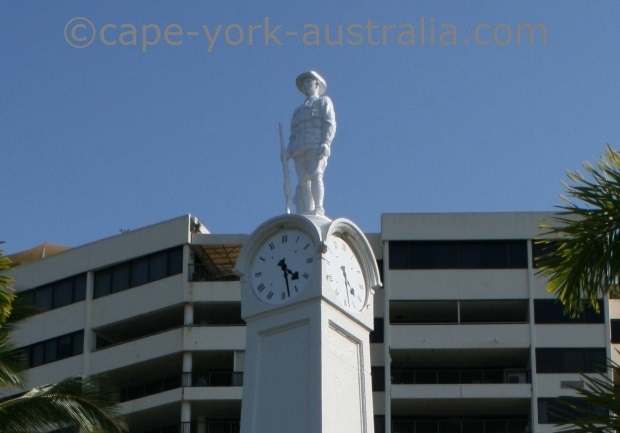 Cape York is obviously part of the Australian state of Queensland, and Brisbane is the capital of Queensland, so we use Brisbane time, which is 10 hours ahead of the Greenwich time in London. 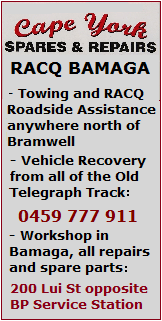 Click on the link above (page coming soon) to see the current Brisbane time ticking. In the Destination Guide, there used to be a three pages dog chapter. * Leave your van just south of the Cape - where to store - even for FREE - yes - FREE caravan storage while you are up the Cape! 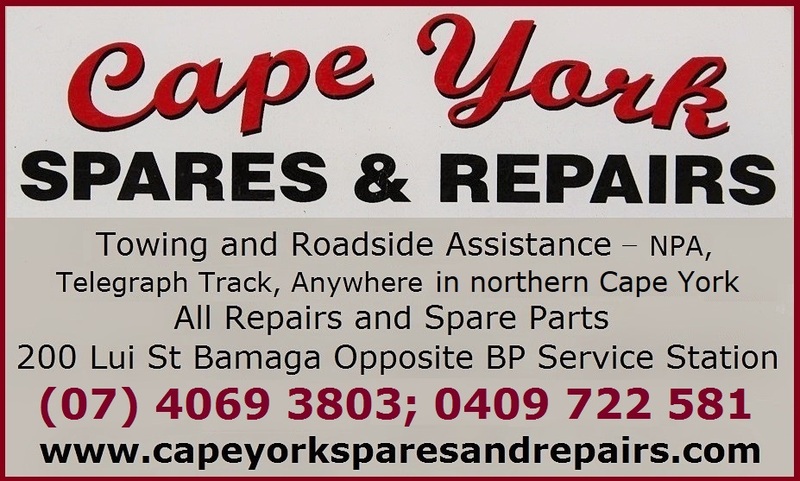 * Bring your van up to the Cape - how to minimise damage, is there a best time to go? * How to still enjoy the adventurous tracks even though you took the van? 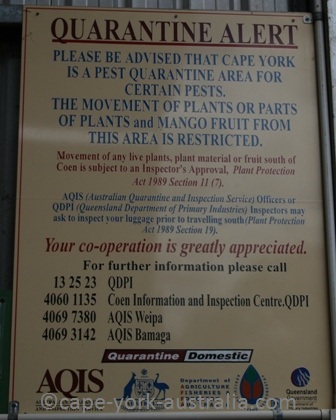 Australian quarantine laws are strict in Cape York and elsewhere. 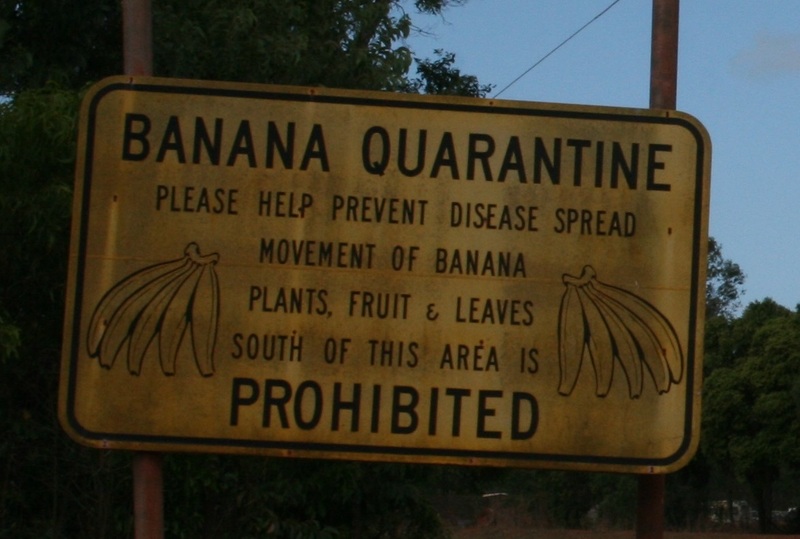 Australia has been able to avoid a lot of diseases, pests and weeds thanks to its strict quarantine laws. But it is not only about taking things into Australia. Being such a large country, there needs to be protection within Australia, so there are state quarantine laws as well. Western Australia particularly is very strict about taking any fruits or vegies into the state. 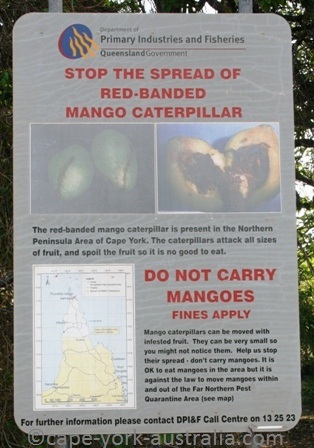 In Cape York, things are the other way around - you are not allowed to take certain fruits out of the area. This is because Cape York is so close to Torres Strait Islands as well as our northern neighbours Indonesia and Papua New Guinea. 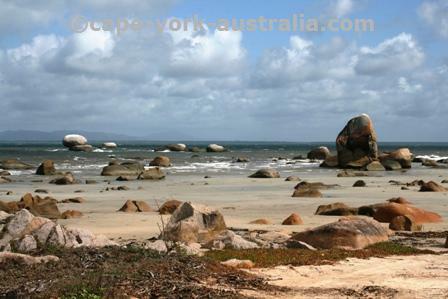 Cape York acts as a buffer zone between Torres Strait and the rest of Australia. There are a fair few fruit deseases north of us, and some of it gets into Cape York. But they need to stop here because they could destroy Australian agriculture, if taken south from Cape York. 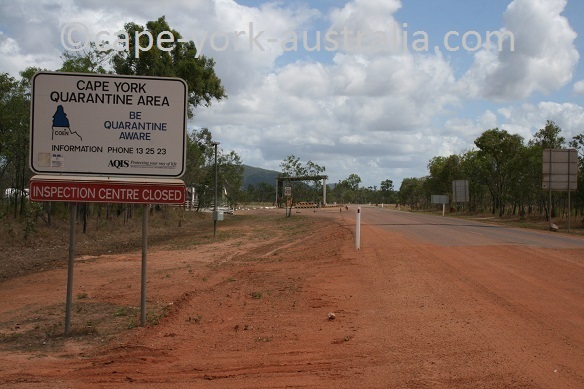 If you drove up to Cape York, you remember the Quarantine Information Centre just north of Coen. You did not need to stop there on your way up, but on your way down you do. I know they are not open every time of the year seven days a week, but even if they were closed you are meant to stop, get the current info (it may change over the time), and leave the prohibited fruits (most likely any mangoes and bananas) in the bins provided. If you are from the rest of Australia and ignore this, you are helping to bring the trouble into YOUR OWN back yard. On your travels in Cape York you have to remember alcohol restrictions. 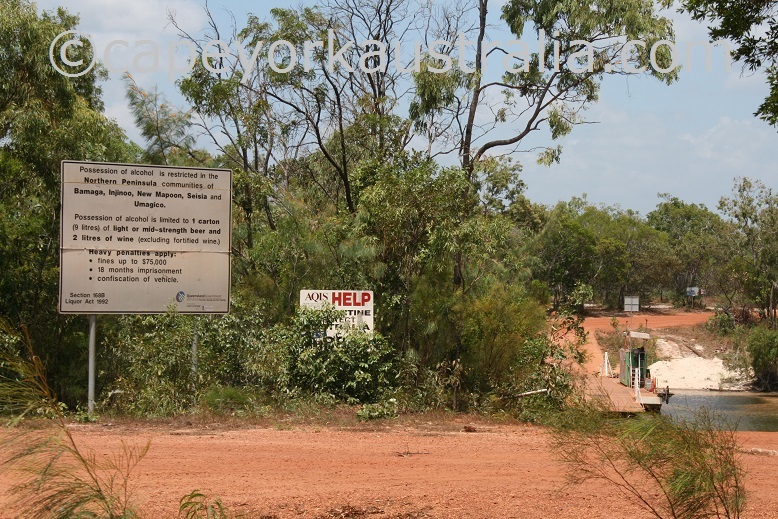 These are in place in most Aboriginal communities in Cape York. There are two types of them. How much you are allowed to carry can be limited to an amount of alcohol, or possession of alcohol can be totally banned in a community. If it is limited, the limits apply per vehicle no matter how many people are in there. However, what most people don't think about is that the alcohol restrictions also apply outside the communities themselves, where you are fully responsible for carrying alchohol in your vehicle. And - you don't want to risk to get penalised! Alcohol restrictions are a law up here and by not obeying this law you can face instant vehicle confiscation, fines up to $75,000 and inprisonment for up to 18 months! Full details about every place, with maps about where the restrictions apply, are in the Destination Guide. 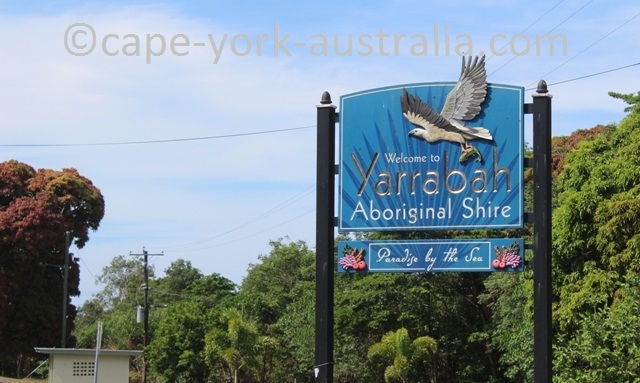 Yarrabah is south of Cairns, and possession of alcohol is limited to one carton of light or midstrength beer and one bottle of wine. 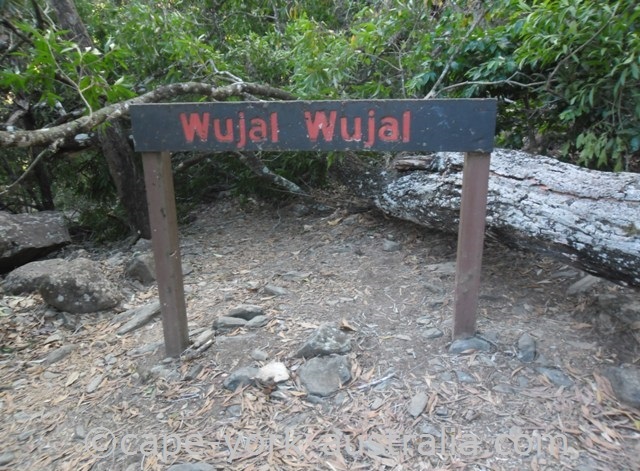 Wujal Wujal is south of Cooktown, and possession of alcohol is banned, with a bona fide traveller exemption. 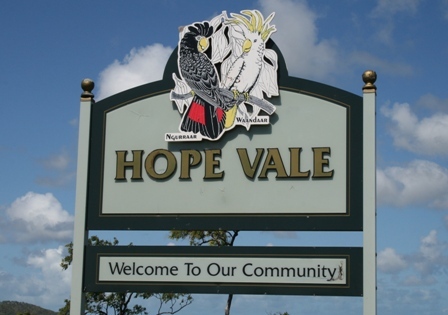 Hopevale is north of Cooktown, and possession of alcohol is limited to one carton of light or midstrength beer, and one bottle of wine. Lockhart River is near Iron Range national park, and possession of alcohol is banned with a bona fide traveller exemption. 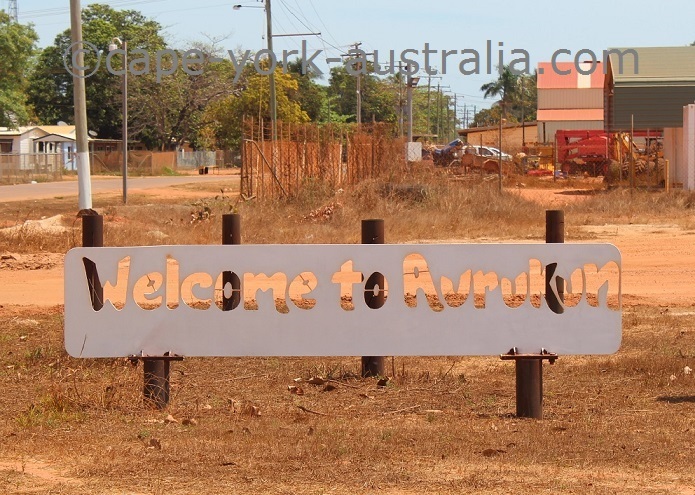 Aurukun is south of Weipa, and possession of alcohol is banned and there is NO bona fide traveller exemption. 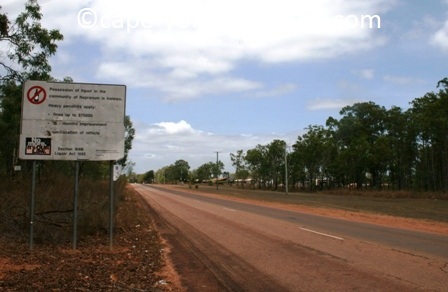 Napranum is south of Weipa, and possession of alcohol is banned with NO bona fide traveller exemption. 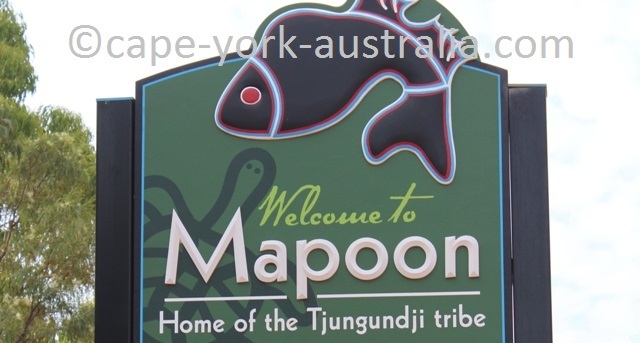 Mapoon is north of Weipa and possession of alcohol is limited to two litres of wine and three cartons of light to midstrength beer. In Umagico, Injinoo, Bamaga, Seisia and New Mapoon, you can carry two litres of wine and one carton of any strength beer (/or premixed spirits). These are two remote communities in south-western Cape York, and possession of any alcohol is banned in both, with NO bona fide exemptions. P.S. The information on this page is only short, full detail on each place's restrictions and where exactly they apply are in the Destination Guide.